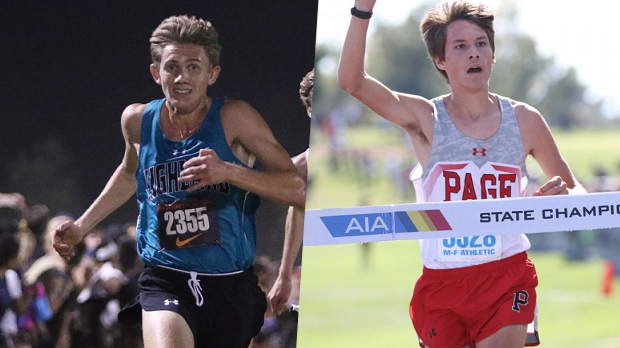 Who Was The Arizona Boys XC Runner Of The Year? It's time to decide who was the Boys' XC Runner of the Year and it's down to two boys who each had phenomenal seasons. There are cases to be made for both of them and we decided to briefly recap both of their seasons before letting you cast your votes. Leo Daschbach was the first Arizona boy to run sub-15 since the now legendary Class of 2015. At Nike Desert Twilight Festival, he stuck it out with the lead pack led by Cole Sprout, Cruz Culpepper and Kashon Harrison to finish 5th in 14:52.6 for a US #20 mark for the 2018 season. He secured victories at every other meet until the AIA State Championships where the effects of a lingering bug got the better of him and kept him from securing a cross-country State Title. The following week at NXR-Southwest, Daschbach crossed the finish line in 19th place as the first Arizona runner in the Boys Championship race. Like Daschbach, Bowen Martin secured multiple victories throughout the season at the Pizza Edge, Peaks XC Invitational, Canyon De Chelly, and at the Ojo Rojo Invitational. At the Nike Desert Twilight Festival, Martin finished 8th in the Boys Sweepstakes race as the second fastest boy in the State. At the AIA State Championships, he secured an individual State Title in his final interscholastic cross-country race with the fastest time of the day. Additionally, he led the Sand Devils to a team victory at the AIA State Championships for the 5th year in a row. Cast your votes in the poll below. Voting ends 9 am on New Year's Day 2019.